Opening a restaurant is hard. Opening it in Chicago is even harder. Everything from storefront leasing, space build-out, attorney and architect fees and zoning, application fees, licensing and incorporation (hello Chicago!) can separate passion from reality. And the folks behind Tuesday Night Dinner want to turn their passion into a brick-and-mortar reality. 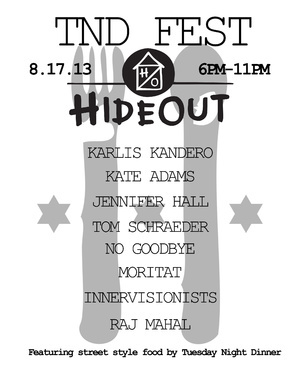 TND productions is linking up with The Hideout this Saturday (8/17) to present TND Fest -- a fundraiser to help Tuesday Night Dinner Productions fuel the Kickstarter campaign, which is currently at $10,000, in support of their restaurant, Border Oak Cafe. The fest will include art, music, a made to order screen printing station, and street style food from the TND kitchen (available for purchase on site). For more information visit their website. Tickets are $10.